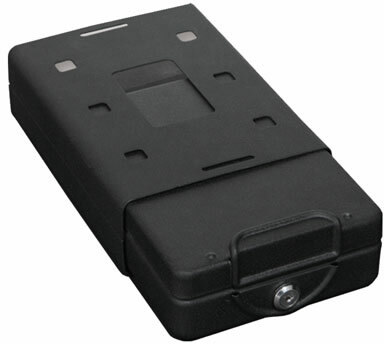 The Bulldog car safe is ideal for use in cars, trucks, vans, boats, in the office and at home. Mounting bracket can be mounted anywhere with included hardware or it can be secured without the bracket by using the included 3' security cable. When the box is locked it cannot be removed from the mounting bracket. Do you charge sales tax on gun safes? Do you offer quantity discounts on gun safes? We are happy to offer quantity discounts in most cases. Please email a representative for a free quote. Do you price match on gun safes? It is our promise to our customers that we have their best interest at heart. We work hard to keep our prices as low as possible, and most often you won't find anything for less. However, if you do find a lower price please contact a representative to see if we can match it. While comparing prices please be sure you include the shipping costs and any taxes. You will often find a lower advertised price which is then marked up with an extreme shipping cost. What is your Return Policy for Gun Safes? First and foremost we take great pride in ourselves and our products therefore customer satisfaction is our number one concern. We urge customers to double check their orders before check out but when necessary we do have a 30 day return policy on all pre-manufactured items. The process is quite simple. Please notify a An Able's customer service representative of your return to receive a return authorization number and the correct location to send your item. It is essential that each item is in its original condition and packaging. Customers are responsible for the return freight charges and a 15% restocking fee. Once the return item has been received and inspected you will receive a credit for the total of your purchase minus the freight and restocking fees. Please Note: Unfortunately we can not receive returns on custom build items. If the item you are purchasing requires manufacturing specific to your order details the item is not eligible for our 30 day return policy.